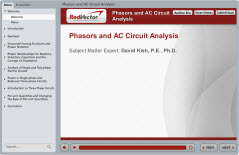 RedVector is proud to announce a new course, Phasors and AC Circuit Analysis. This two hour course is mobile-ready and will build a foundation of skills you can use to become familiar with concepts involved with fault load and load flow studies, along with arc flash analysis in electrical power distribution systems. This RedVector course was authored by Dr. David Kish, P.E., who earned his BSEE, MSEE, and Ph.D. in Electrical Engineering from Purdue University.